The higher a risk ranks for these qualities, the more threatening it is to your organization. The most severe and frequent risks, your primary risks, are critical and would hinder your ability to conduct business. Risks that are severe but unlikely, your "detect and monitor" (D&M) risks, are those that need to be watched but don’t require heavy mitigation strategies. Risks that are highly likely but insignificant, your monitor risks, will not impact your ability to continue operations. Finally, the risks that are low in both frequency and severity, your low control risks, can be revisited on a yearly basis to ensure the risk remains low. Risk management begins with building a list of all risks your organization faces. Depending on your industry, this number could range from a handful to hundreds. Risk mapping is beneficial because it requires you to assess each risk and its causes and consequences individually. It also allows you to look at your risk environment as a whole and understand how frequencies and severities compare. 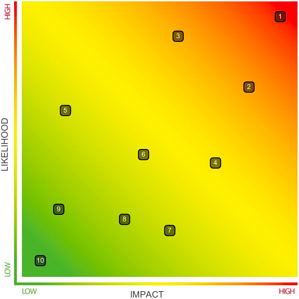 Finally, a risk map is a visual that anyone in your organization can use to see the big picture of risks most prominent in your industry or workplace. With limited resources, it's important to be strategic about mitigation techniques. Risk mapping allows you to determine what steps to take first: implement prevention tactics for the most frequent and severe risks before moving onto others. This prioritization method ensures that you address the risks that have the most potential to cause harm to your organization. Whether your organization consists of 2 employees or 2000, risk managers have limited resources. Risk mapping allows you to use them to prevent primary risks. D&M risks should be revisited several times a year to ensure appropriate management. Similarly, monitor risks typically only need to be checked yearly to ensure their potential impact hasn't grown. Finally, by figuring out which risks are low control, you will know where not to spend time and money. Risk maps can also help your organization in becoming ISO certified, as it shows that you have an understanding of your risk environment and a strategic plan for moving forward. This can also help you receive competitive insurance premiums. Insurers are looking for "good" risk, or companies they believe will have minimal losses. Presenting your risk management plan and prevention strategies shows the insurer you are actively managing risk, which will result in a lower premium. Risk maps are recommended for any organization looking to enhance risk management culture. They bring understanding and prioritization to the risk management department. Our software, ClearRisk Manager, is an excellent tool for quickly and easily building risk maps. You simply have to enter your risks and rate them in terms of frequency and severity. Want more information?